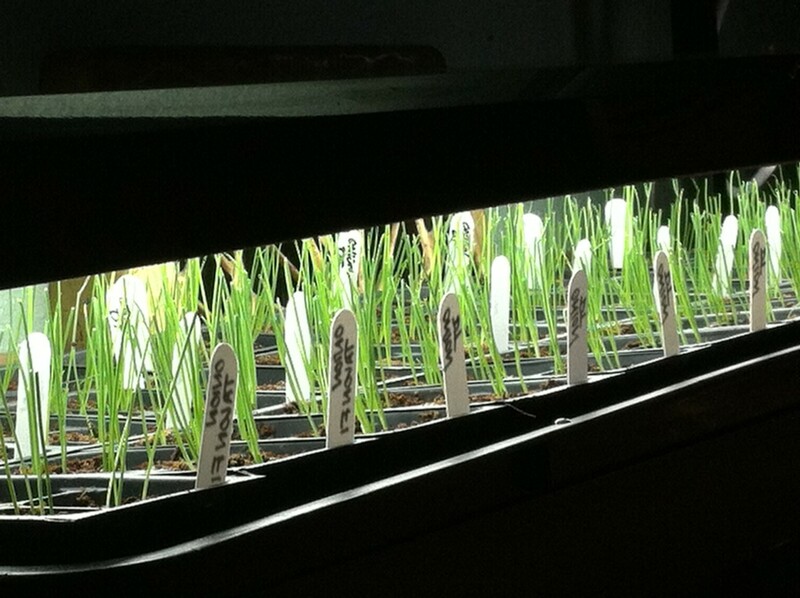 Seed starting has commenced, and the onions are up and growing nicely. I’ve got three varieties this year: Long Red Florence for the tasty fresh-eating and kabob onions of summer, as well as my standby Talon F1 yellow storage onion (which I’ve gotten from Territorial Seed for a few years, but now I see High Mowing has it, too). A new yellow storage onion for this year is the open pollinated Dakota Tears, developed by Prairie Road Organic Seed. They are looking really fine. Blue Solaise leeks are another old favorite–germination is a little thin this year as the seed is getting old. Last year I planted 80 row feet of them, but between flood, drought, and weeds, they only ever managed to get to pencil size–not their usual stout, blue flag-waving grandeur that can last through the winter if the deer don’t get desperate. Started some Mars Celeriac (and with fresh seed, too), but even on a heat mat their germination has been disappointing. We’ll end up with a few for our table, at least. Yesterday the peppers went in 4-packs on the heat mat–ten varieties with six of them sweet and the rest some shade of smoky. A few new ones this year including Three-Sided From Syria (a last-minute curiosity), Aconcagua (intriguing for years–finally taking the plunge), and a mini belle pepper blend to satisfy my curiosity about that recipe for little peppers stuffed with cabbage and pickled whole. The only new hot one is Martin’s Carrot, which came as a bonus for re-upping my Seed Savers Exchange membership–so why the heck not? I won’t start tomatoes for a couple of weeks, but the situation is starting to get a little desperate as far as varieties. My December seed inventory lists 13 varieties, which is fairly respectable, but somewhere along the seed-ordering way I’ve ended up with 21 kinds, and then a discussion with a fellow gardener about good little yellow tomatoes landed me on High Mowing’s website adding Yellow Perfection back into my mix–along with two MORE varieties that sort of slipped into my cart unnoticed. How does that happen? At this rate, I’ll be up the thirty by the time I actually put seeds into medium, and being as I’d like to get them going in the one 20-channel flat I have left…well, I’d better stay away from seed company catalogs and sites for awhile. Though, as any gardener with gardening friends knows, that isn’t always a guarantee. You run into someone, you get to talking tomatoes, and suddenly there’s another packet or two in your purse. Going into hiding might be the only option. I’m sad to report that we lost a hen last week. She was an Araucana-Jungle Fowl cross, and she’d been listing around for a few days. The others weren’t picking on her, and she was able to get to food and water (and was consuming both), so I didn’t worry too much about it. She wasn’t roosting at night, but she did find comfort with the broody Silkies that hang out on the floor. Still, when I went to shut the coop on Wednesday night, she was keeled over in the run. Bummer. Despite a few glorious days of temps in the forties and fifties (yeah, we have a lower bar for “glorious” after this winter), the majority of days have been chilly, though bright. I’ve got the whole set-up ready for brooding about a dozen more pullets for the laying flock (and then fifty broilers and a few turkeys and guinea keets after that), but out on the porch it’s hard to keep their pen warm enough except for directly under the heat lamp. I’m getting to the point of setting up an insulated pen-within-the-pen because I want those pullets feathered and ready for the coop before the broiler madness starts. Meanwhile, we are getting about seven eggs a day from the existing small flock, and the yolks are starting to regain that intense golden color that signifies they’ve been out on grass. Other than giving a few away until there’s enough production to merit selling, my egg utilization strategy combines browbeating family members about consuming their daily ration and ordering in a few pounds of semolina flour to make fresh pasta. Lucky for the family–we have a young man visiting from Germany (a former exchange student of John’s) who is capable of eating an entire day’s production in one sitting (willingly, too–it’s not a force-feeding hostage situation, I swear!). With the ground bare but still frozen, the only serious outdoor activity I’ve engaged in lately is the endless hauling of buckets-full of trash from the grove. The area nearest the house is getting less junky, but barefoot-ready it’ll never be. Still, aside from the endless piles of rusted-out cans, broken glass, and car parts, there are some cool old intact bottles to be found in the deeper recesses. Making it out as a treasure hunt rather than a years-long chore seems like a better way to attract helpers. C’mon out and join the fun! Being in the flyway was truthfully neither among the criteria nor motivation for us when we decided to buy this farm situated just up the hill a-ways from Big Stone Lake. As we began carrying the buckets and boxes of discarded lath-work and crumbled plaster to the huge dumpsters we were often stopped by the skeins of geese, by both the sound and the beauty of flight as they moved from fields to frozen wetlands. Then, on the drive back and forth from Rebecca’s house in Clinton, we watched as continuing populations of different ducks stopped on the way through. Redwing blackbirds soon took up negotiations in the cattails on the sloughs along the roadways, and in the grove, flocks of various songbirds came to rest and roost. 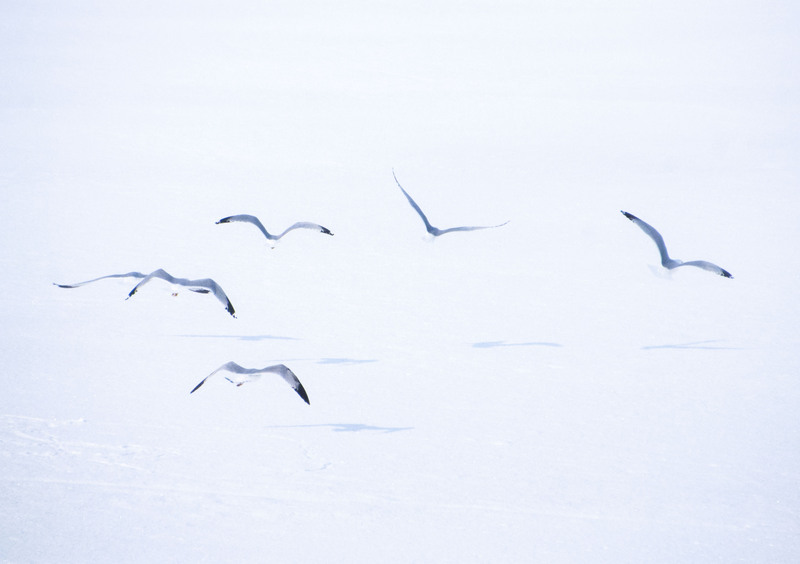 Migrating gulls rise from the ice at the National Wildlife Refuge. Every day became an adventure. Rebecca saw her first merganser, and my excitement in seeing my first curlew was duly noted. Now, a year later and with the inside work completed, we await a new migration. Over the winter I purchased a photographic blind as part of that anticipation. Already the vees of geese are flying overhead, and a couple of nights ago we watched as two huge flocks of snow geese flew overhead reflecting the golden hue of the sunset. Someone mentioned that the redwings, which for me have traditionally been the true sign of spring, were seen just south of here. In two days of travel through the area, though, I’ve not seen a single one although there are cattails along many of the roadways and highways. For ten years we lived in the heart of the Mississippi flyway along the Little Vermilion River just east of Hastings. The Little Vermilion cut through town, then through the near wilderness backwaters parallel with the Mississippi from Hastings to Redwing, a distance of nearly 30 river miles. This land was swampy and wild, filled with trees and backwater lakes. After more than a decade of living in Colorado, moving into the flyway was thrilling every spring and fall as new species of birds continued to find the feeders just outside our dining room table. Hours were spent watching this bird life just inches away from our plates, and really, we catered to the birds with our landscaping and plantings … as did many of our neighbors. 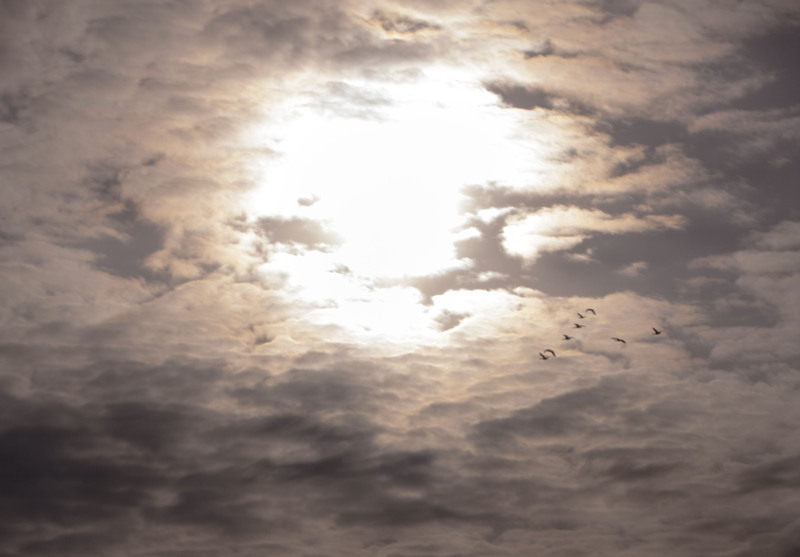 Small skein of geese in the morning sun. Here in the Minnesota River flyway, which by most accounts is still part of the Mississippi, we see a much different grouping of birds. We certainly see more ducks, geese, gulls, terns and wading birds, along with the “usual suspects” among the warblers and songbirds, here than on the eastern side of the state. Last spring, by chance, one of us looked into the high canopy of the grove and suddenly realized what we were seeing wasn’t leaves but rather hundreds of birds resting from their flight. Being outside this time of year is special, and especially for the sounds. Each sighting reminds one of that sense of comfort in greeting an old friend. “Welcome back to the neighborhood,” you want to shout. “You missed one hell of a winter.” Ah, yes, seeing them, one and all, is knowing spring is coming. In his Sand County Almanac, Aldo Leopold wrote, “A March morning is only as drab as he who walks in it without a glance skyward, ear cocked for geese.” I’d suggest the same holds for a March afternoon. While it’s true the flyway was neither criteria nor motivation, finding an area where the very last less than one percent of the prairie pothole biome has yet to be shadowed by the plow or drained by plastic drainage pipe was certainly in our thoughts when we bought our farm. Just over the ridge to the east, and up the hill and across the road, are two beautiful wetlands, and although this area is definitely part of the sea of summer corn that has replaced big bluestem in the prairie pothole ecology, our county has in my estimation probably the highest number of the original potholes (wetlands, sloughs or whatever noun you choose to use) in Western Minnesota. It’s these wetlands, my choice of noun, that attracts the geese, ducks, mergansers, gulls, terns, eagles and waders, and the old farm groves, remaining oak savannas and tree-lined edges of Big Stone Lake and a few of the gullies that haven’t been dozed into field configurations, and provides refuge for the song birds. Eliminating these last remaining few pieces of the ecology would likely divert the birds elsewhere. Redwing blackbird establishing his territory. For now the flyway is alive, although we’re well past the days spoken of by old timers my age who remember when the prairie skies were blackened by waves of migrating redwing blackbirds. These are stories that typically begin with, “When I was a kid …” Yet we can look skyward and see the skeins of geese, sometimes several at once, some with hundreds of birds, all making announcements of an awakening spring. It is up to us to keep our ears cocked and eyes skyward as March marches on toward April. Earlier this week while Rebecca was gone for a meeting I sat with a cat in my lap on the couch in the solarium and watched a mass of birds launch from a treeline across the field from our farm, a mass that turned suddenly to fly directly over the house. Not a sun blotter, but an impressive number. Meanwhile, skeins of geese continued to pass between the lowering sun and my perch on the couch, enough so that I finally sat the cat aside and went for my camera. And I sat for almost an hour waiting as the sun followed a slow path, and finally a quick sink, as no more skeins appeared … although I heard several pass on the east side of the house nearer the wetlands. Spring migration, when the sky is alive with sound and feathered fury, is my favorite time of year. Both of us have children. With luck, perhaps, they will live long past my lifetime, and even Rebecca’s. With luck, perhaps their’s will be a comfortable life, economically and environmentally. Luck, perhaps, is nebulous, for it wasn’t even a week ago she rose from her office chair and went off into one of her classic rants about the state of earth. Though I don’t recall the exact topic, it could have been our continued and shared views on the disrespect being shown to soil in farm fields by neighboring farmers, or of the frac sand mining issues. We discuss many politically sensitive subjects, and many have to do with the environment and both the corporate and non-corporate attacks on our dear Mother Earth. Translated this would suggest that should our own Congress ever do something, let alone countries like China and India where emission standards are so low that thousands of residents of those nations resort to wearing facial masks, life as we have known it on earth is likely past the point of being saved. True to character, I threw out some lame bit of positive argument that went nowhere. Our conversation came to mind while listening to a presentation by Mark Seeley, a University of Minnesota climatologist and MPR climate darling, at a Land Stewardship Project gathering in Starbuck. He was nearing the end of a compelling presentation augmented with factual data on how our Minnesota climate has changed so dramatically in the past three decades. Yes, our winters are certainly warmer … even if our past winter was considered an aberration more so than the norm of just a few decades ago. 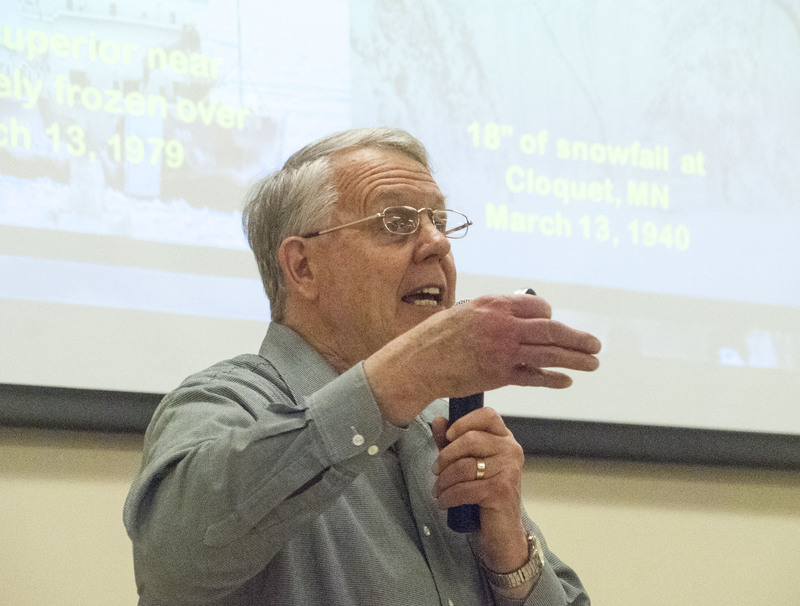 Climatologist Mark Seeley makes a point in his presentation at the Land Stewardship Project’s Starbuck, Minnesota, gathering. And, yes, our summer dew points are also rising, along with the frequency and fierceness of severe weather events. Humidity is rising, along with coincidental health and pest issues. 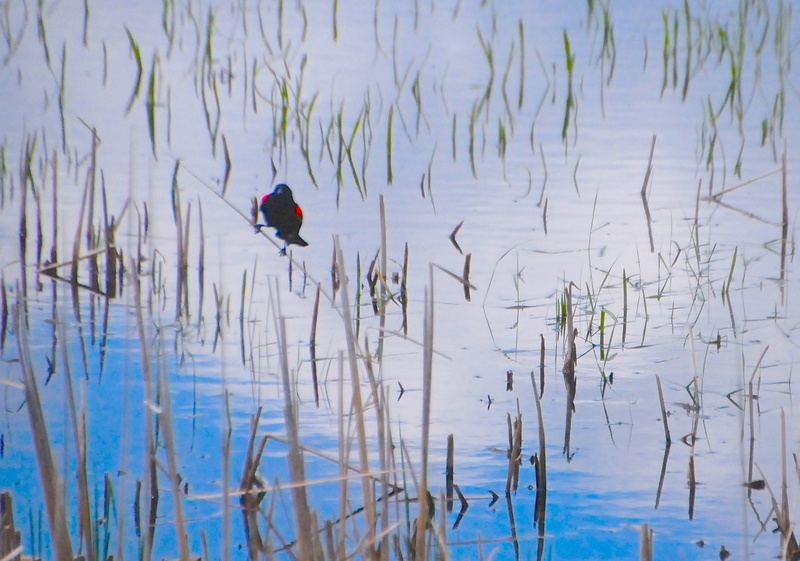 Droughts and flash flooding are as common nowadays as blackbirds in the bulrushes. In the same years of record high moisture events, we have consequential droughts recorded. An overnight, ten-inch rainfall in Duluth was followed by months of drought. Events are more localized, in that a farmer might have enough rain for a crop while a neighbor just to the south records a drought. Minnesota has recently set records for the number and frequency of tornadoes, and F5’s, once more common much further to the southwestern states, have been recorded both here and in Canada. Consequently, with such variances in catastrophic weather events, property insurance rates are going ever higher and higher. Near the end of his presentation, Seeley displayed a set of maps that showed modeled projections of a narrow climatic band that crossed the state through the Twin Cities, a band modelers at the University of Minnesota project will reach the Minnesota-Canadian border by the 2060s. Among the 100 or so in attendance in the cavernous hall, a dropped pin might have crashed like thunder. 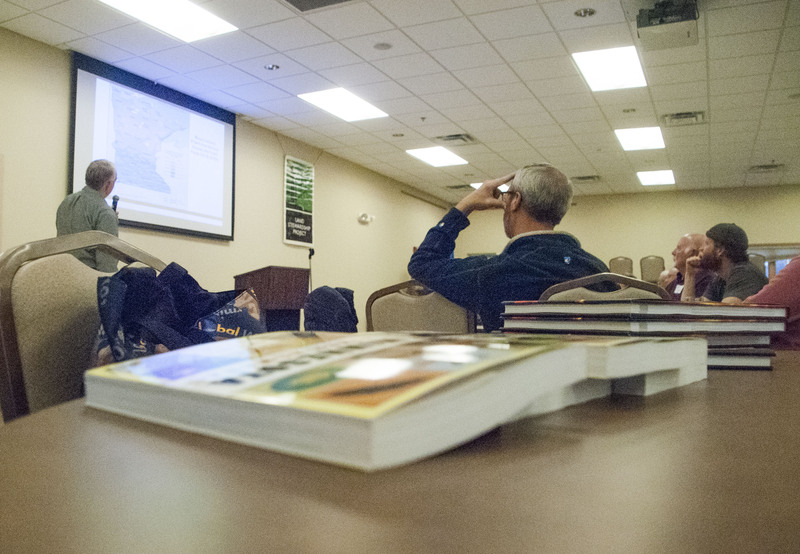 With Seeley’s “Minnesota Weather Almanac” in front, he keeps a large audience spellbound with his data presentation. In the morning news, little had changed. Up north the EPA had okay-ed a permit for Polymet to continue forth on its efforts for huge, open pit copper mining despite the threats to both ground and surface waters, including the adjacent Boundary Waters Canoe Area. Country ditches, already clogged with snirt from melting snow, are now filling with muddy runoff from farm fields. No changes were forthcoming in frac sand mining, West Virginia’s drinking water supplies, North Dakota’s groundwater issues nor a proposed a mid-continent pipeline for moving oil sands. And, yes, more photographs of Chinese residents wearing protective face masks due to emission pollution. In other words, a status quo on climatic issues and threats worldwide. Years ago in my previous marriage I expressed concern on learning that we were expecting our first child together, for as a nation we were entering extremely uncertain financial times. Those have evolved to a point where the children born in that generation are basically unemployable as a result of the economy. Those same children, now young adults, are facing a future that doesn’t bode well in terms of an even greater threat … the health of the very earth we all share. For them, their children, and especially their grandchildren. Even as a confirmed optimist, I don’t envy their future. Back at an age when mother-pleasing was something boys seven or eight find easy was perhaps when the concept of wind first entered my consciousness. We were in the midst of one of those sultry 90-90 Missouri summer afternoons without air conditioning with no hint of a comforting breeze. We had a young elm, or so it seemed. I scampered up the tight bark, grabbed a long and low hanging limb to pull myself further into the heart of the canopy. Using my arms and legs I started pushing limbs and jumping on the branches with all my might. If I could just get some air moving, I thought, the wind would begin. A passerby might have slowed at the vigorous movement in the center of the tree … until one of the branches holding me aloft snapped and I was sent sliding down into the yard. 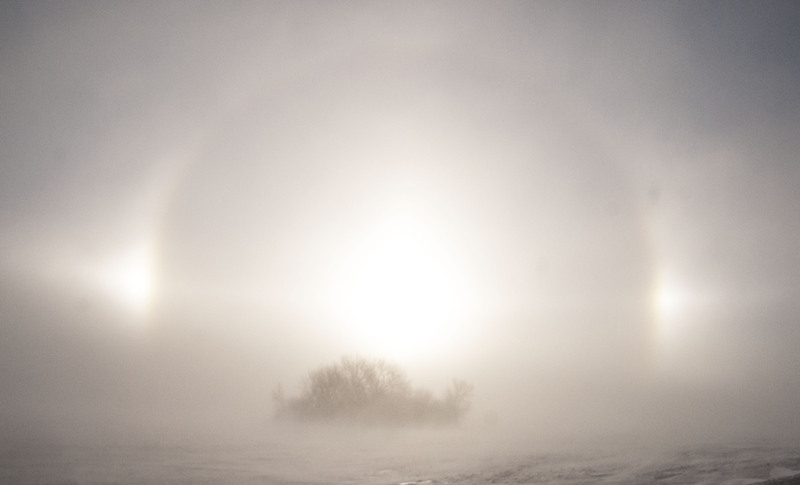 Wind-blown snow creates a halo effect on a prairie wetland. 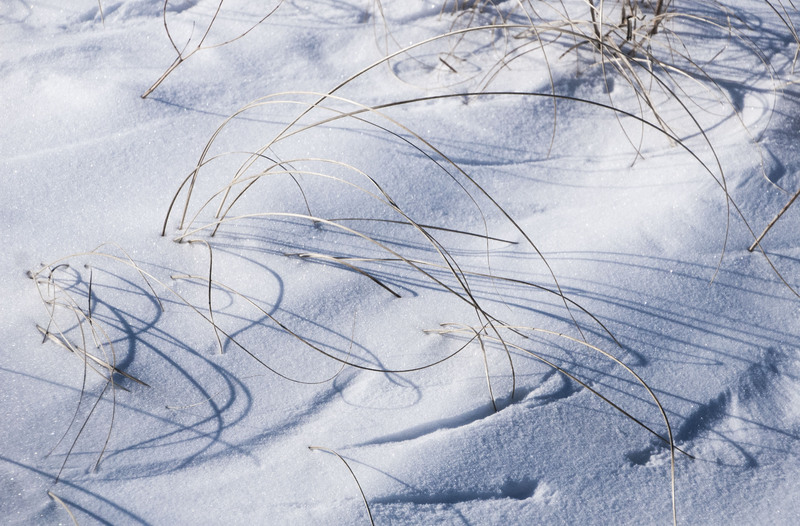 Tips of prairie grass leave wind-etched “poems” in the winter snow. This haunting caused a friend to recently tease me of how I could happily forgo watching commercial television programming for cultural media awareness in order to follow my passion for making images of prairie grasses in the wind. “You must realize that watching prairie grasses blowing in the wind isn’t for everyone,” she chided. Indian Grasses dance in a prairie wind. Wind is my weakness. There was that late fall evening in the 1970s in an old farmhouse outside of the Newton, IA, home of the teenage boy who’s letter prompted Pope John Paul II to visit Iowa, when I asked the family while I was doing his story if I could spend a few moments alone in an upstairs bedroom just to hear the whistling of the wind. They smiled as I backed into the room and turned off the light to sit on the bed. It had been years since I’d heard that whistle and whine of the wind in the sleeping porch of my parent’s old Missouri farmhouse. It whispered a momentary meditation. So, yes, I have many wind stories. Last weekend as I sat alone in my canvas ice fishing “clam,” a ferocious wind whipped and snapped the canvas during a Severe Winter Warning with a -45 degree wind chill, bringing many wind moments to life as I fought off the bone chilling cold. Wind games, if you will, playing with the mind and the numbing elements. Many tell tales of friends being caught, or of themselves being in instant peril, being stranded miles from a boat launch or pushed against a distant shore, of being capsized and adrift. This time on the ice was as close as I have come to feeling the heed of their warnings. Despite the side flaps of the canvas panels being buried beneath ample ice chips and snow, the canvas snapped and popped with incredible and forceful energy. I was afraid of standing, fearful of the clam blowing away down the length of the lake. As I watched the undulating sides of canvas I was visited with another wind game, from of all places, the Caribbean somewhere outside of Road Town, BVI. I suddenly visualized being on the deck of the 210 ft. barquentine I was fortunate enough to help sail in the late 1970s. As we maneuvered the big square-rigged sailer into open seas, the huge sails filled with wind, snapping and popping the sailcloth just like it was my ice fishing canvas on Big Stone. Indeed, these were the only sounds as the antique naval training ship listed slightly and cut a magnificent wake in the azure sea. I could only wish the mental images of the blue Caribbean skies had been more warming, as had the few jumbo perch pulled up through the ice. This would be another day dominated by prairie winds sweeping in from the Saskatchewan Plains, winds that once again lifted loam and snow into the skies up on the prairie and rattled old windows. Indian Grass and heads of cone flowers moved by prairie winds. Through the night gusts rumbled through like a distant freight train, warded off by solidly insulated walls and a bevy of quilts made by the mother of her modern day Don Quixote, a man who has come to realize he can neither start nor end a wind … even he might wish to.